A yearslong effort to update Utah’s hate crimes law took a significant step forward Thursday, earning the unanimous approval of a Senate committee after failing to be granted an initial hearing during previous legislative sessions. Thatcher credited the support of diverse community groups and individuals in helping to sway the opinions of his legislative colleagues. He also said high-profile crimes — such as the recent attack of a man and father at a Salt Lake City tire shop — had generated public attention on the topic of enhancing criminal penalties when victims are targeted based on attributes like race, sexual orientation or religion. Utah’s current hate crimes law applies only to misdemeanor offenses and has never been successfully prosecuted. “It is impossible to really understand this issue and not come to the conclusion that the state of Utah needs to act,” Thatcher said. 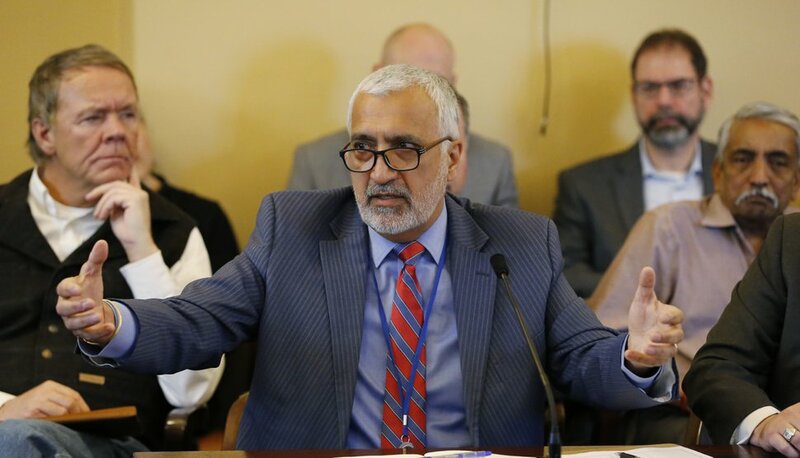 (Rick Bowmer | Associated Press) Salt Lake County District Attorney Sim Gill speaks to the members of the Senate Judiciary, Law Enforcement, and Criminal Justice Standing Committee at the Utah State Capitol, Thursday, Feb. 21, 2019, in Salt Lake City. A panel of lawmakers is approving a proposal to strengthen Utah's hate-crimes law, a key step forward for the idea long stuck in legislative gridlock. Gill previously has been critical of Utah’s hate crimes law and said that Thatcher’s bill “finds that balanced approach” for prosecutors to consider enhanced charges for victim-targeting crimes. Representatives from the United Jewish Federation of Utah, Zion Evangelical Lutheran Church and Catholic Diocese of Utah also spoke in favor of SB103. But Gayle Ruzicka, president of the Utah Eagle Forum, objected to the bill’s classification of potential victims. Current law treats all victims equally, she said, while SB103 would exclude some individuals while offering legal protections to others. Ruzicka said she and her family have been threatened because of her work with the Eagle Forum, but her status as a public political figure would not result in enhanced penalties if she were the target of a crime. The list of victim classifications was also questioned by Libertas Institute President Connor Boyack. SB103 was amended to garner more support among Senate Republicans, with the addition of attributes such as age, marital status and the school a victim attended potentially qualifying for enhanced criminal penalties. Sen. Lyle Hillyard, R-Logan, said there is a risk of broadening criminal enhancements beyond efficacy. He gave the example of drug possession enhancements in the vicinity of schools, parks and churches and quipped that the only way to avoid those penalties in Logan is to be flying over the city in an airplane. But he added that passing SB103 would signal that Utah is serious about crimes that target victims and generate fear within a community. Thatcher agreed with Hillyard, saying his bill would not end hate crimes but could help to mitigate them. Many of Utah’s recent high-profile hate crimes incidents have occurred in Salt Lake City, where members of the City Council expressed support for the bill at its meeting Tuesday. “The stories that have occurred in Salt Lake City are particularly important,” said Salt Lake City Councilman Chris Wharton, who is gay. He said he is frustrated with the dialogue around the bill because he believes some lawmakers have a fundamental misunderstanding of the proposal, fearing that it offers special protection for some classes and not others. Tribune reporter Taylor Stevens contributed to this article.